British Barbecue Blethers with MoneySupermarket.com! Like most families, we tend to hit the ground running when the sun comes out and head for the burger aisle! 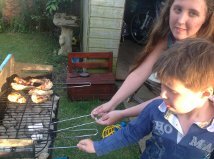 We love barbecues, especially the boys, so when I heard about The Charcoal Challenge from MoneySupermarket.com I knew I'd be getting involved! £50 is a lot of money, so we thought we'd better make a bit of an effort! So... Out came the napkins and flowers! Just because you're eating at home, there's no harm in creating a bit of atmosphere. The thing with barbecues, though, is they can get a bit samey, so we've got a few side dishes to add a bit of variety. The first one, sweet potato chips, are a bit more interesting than normal chips and healthier too. Just peel and chip sweet potatoes, and deep fry, first in a high heat for just a few minutes, then in a medium heat until cooked through and crispy. 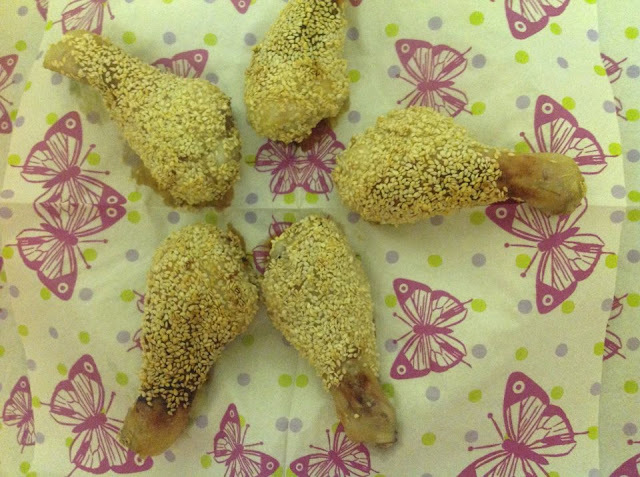 The next is Sesame chicken, which is a really easy way to jazz up chicken, it's particularly appealing to children, because it has a sweet flavour and interesting texture. Just take some chicken portions and coat with a mixture of equal amounts of soy sauce and honey. Then sprinkle generously with sesame seeds. Barbecue, or bake in the oven, until cooked thoroughly all the way through. About twenty minutes, depending on size. 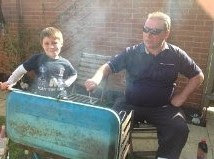 Why is it with barbecues, the boys always think they know best? I think small son is learning some negative stereotyping here! I have to say I love our barbecue. We've had it forever, but it folds up into a little metal suitcase, so is perfect if you have limited storage space. Other really useful tools, which we bought from Tesco in their sale, are long handled tongs and, the ultimate barbecue accessory, the sausage sizzler! I got a bit carried away with the eating, so I don't have pictures of the main course, but it was the usual barbecue fare, because that's what we like! Anyway, onto the dessert! Puddings are always a challenge, because it's warm, so everything gets melty really quickly and the flies can be a pest, so we do it the Cub Scout way by toasting marshmallows in the embers of the barbecue! Children really enjoy this, just make sure you have long metal skewers (we got ours from Tesco, for around £2) so it's easy tto maintain a safe distance. As I said at the start, Money Supermarket gave us £50 to spend on this event, but I'm a hardened scrimper! So, after purchasing everything we needed, including the flowers, we still had enough left to donate £10 to our resident charity effort Auction for Addenbrookes. And with the change? 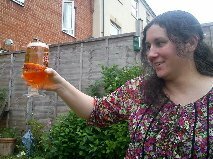 A pint of my favourite tipple, to toast another great adventure!